The Peugeot Bipper, together with its cousins, the Fiat Fiorino and the Citroen Nemo, is a vehicle that differs in important ways from similar vans available on the market today. 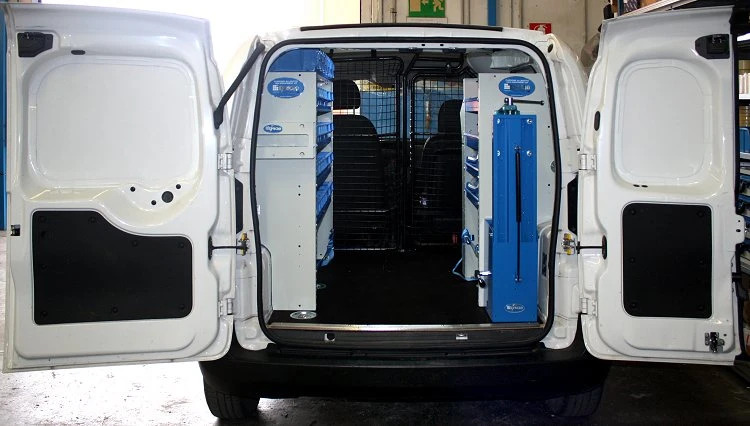 It is in fact a motor vehicle with the body of a van: flat cargo floor, double rear door, and optional side door. However it has the external dimensions of a small car. It is has been a top choice for those who want a compact van derived from a passenger car. To make a long story short … it is a small van on the outside and big one on the inside. 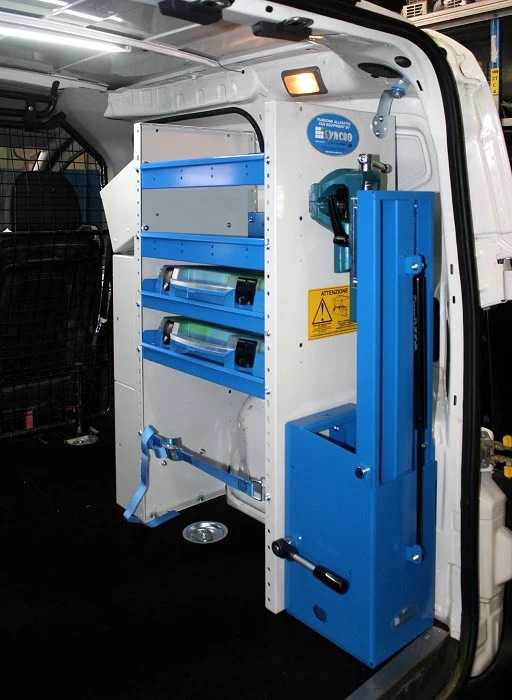 The pictures on this page show that, because of its straight-lined shape, the upfit is similar to one that can be installed on much larger vans. As in most of our upfits, we begin with the installation of the floor panel – the ultra resistant resin-coated plywood panel complete with steel inserts for hooks and protective anti-slip steel borders. The shelving unit on the left side of the Bipper is composed entirely of shelves with removable plastic containers. There are a total of 30 containers (26 or 31 cm deep) that can be accessed directly from the shelves or conveniently transported to any work site. The bottom of the shelving unit has been designed with a strap and buckle for safe storage and transport of utility and tool cases and other equipment. On the end panel, near the back doors, we mounted a spray can storage tray. The folding-down worktop with mounted vice (125 mm) is one of the top products in our Syncro catalog. It is sturdy quick, safe and easy to use: in just a few seconds you have an all purpose cutting, welding and disassembling work station. 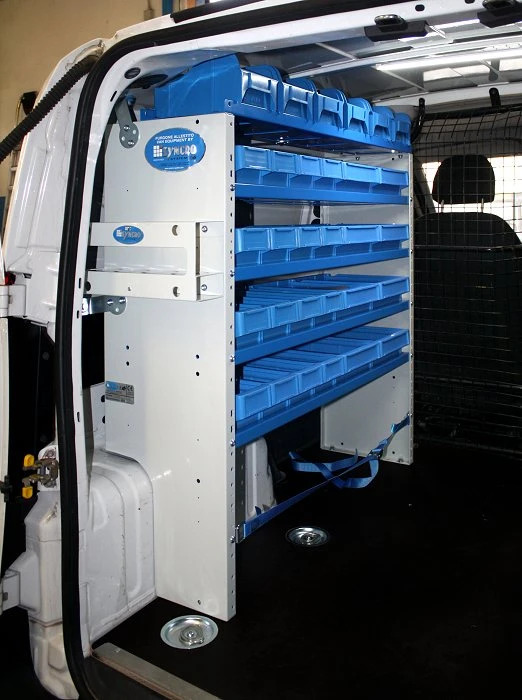 It can be seen installed on the right side of the Bipper, mounted on the racking unit which is made up of two shelves with dividers and two inclined shelves housing two polypropylene Galaxy portable utility cases complete with clear lids. The bottom of the shelving unit on the right side is also equipped with the Syncro safe storage and transport system. 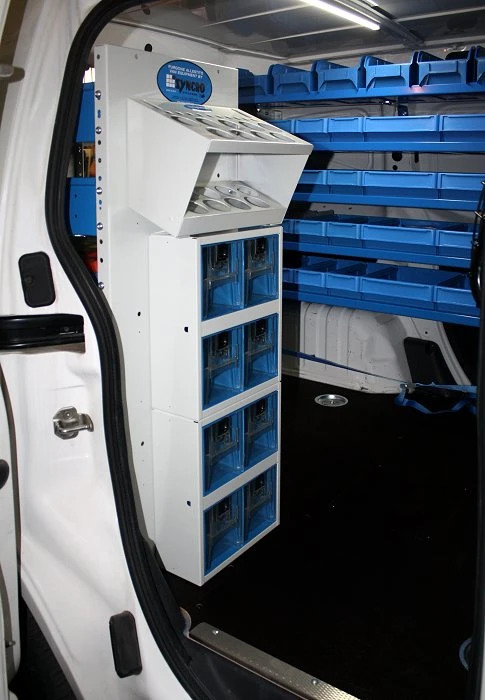 Two other very practical and useful products have been mounted near the the side door of the van: small drawer unit with removable/portable clear plastic drawers complete with automatic locking button, and the silicon cartridge holder which can hold up to nine tubes of silicon or similar products. To light the Bipper, we added a 11 Watt LED light fixture, with touch switch and easy connection to the vehicle's battery. 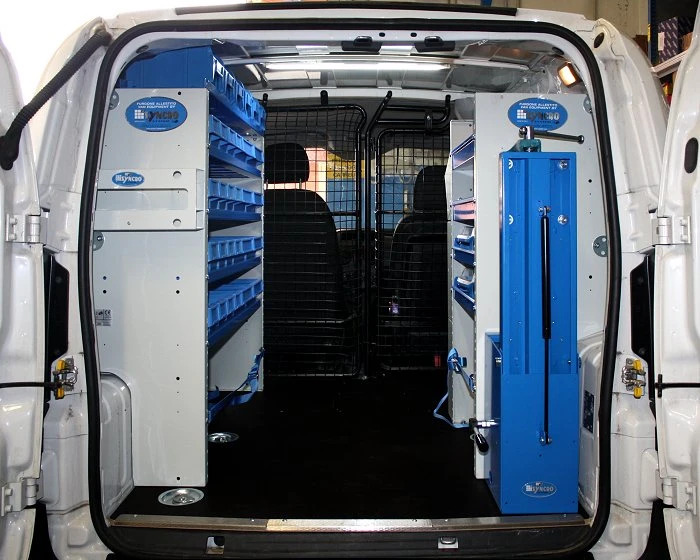 See other upfits for the Bipper with utility racks and interior floor and wall paneling. Bipper Peugeot wall paneling for Bipper upfit for Bipper shelving units for Bipper. An example of an upfit the 'little big' Bipper.